This listing is for the original catalog pictured for September 1987. Contains an amazing number of items for sale by Rogofsky, including comics, magazines, promotional items, books, photos, etc. Neat reference. Photographs are of actual item buyer will receive. All items will be carefully and securely packaged for shipping and insured in transit. Absolutely guaranteed original and authentic. Due to the nature of this item, no returns will be accepted but the eBay Money Back Guarantee always applies if you do not receive what you ordered. 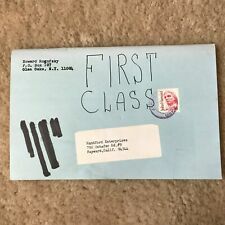 DOMESTIC SHIPPING: Default shipping method is to place item in USPS' hands same or next day to go First Class Mail Package with tracking number uploaded. Expedited shipping (also with uploaded tracking) available at additional cost - see all shipping options. Wizard: "The Guide to Comics" Magazine #9-VENOM Cover-5/1992-NM-/NM: Great Cover Art FeaturesVENOM! Condition Very Fine / Near Mint. 10TH ANNIVERSARY. 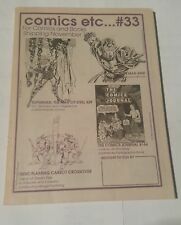 This comic pricing guide is in excellent condition for the age. We will do our best to give you as much information as we can. Wonderful color on the book cover and inside. Binding is also in great shape. Let’s talk grading for a second. Excuse the rant, but slabbing comics is the biggest scam in the history of collecting. I know several major dealers who have sent in big ticket books, been disappointed with the grade, unslabbed the books, resubmitted them, and got a different grade that was more to their liking. 1996 wizard magazine "the guide to comics" x-men top mutant makeovers Good cond. THIS 1996 ISSUE OF WIZARD MAGAZINE. A GREAT COLLECTABLE. PUBLISHED BY WIZARD PRESS IN 1995. THIS MAGAZINE IS IN VERY FINE CONDITION. A NICE SHARP BOOK. EMPIRE STRIKES BACK PROMO CARD - P6. JUDGE DREED PROMO CARD. Very Fine condition …Nice copy. Softcover book …2004 …. Lots of photos …Great reference book for Big little Books …270 pages. Near Mint - condition, and tap the link: Read More for grading details for this Wizard Magazine comic book, Wizard Magazine #83 by Wizard comics, and tap Read More to knock down the total for this Wizard Magazine comic. Wizard Tribute Superman Edition, 1st Edition, unopened with Superman Card. (actual item in scan). Near Mint condition, and tap the link: Read More for grading details for this Wizard Magazine comic book, Wizard Magazine #64 by Wizard comics, and tap Read More to knock down the total for this Wizard Magazine comic. ToyFare Toy Magazine #128. April 2008. Then there is the issue of new house not having storage. we don't have space for this stuff. Most of it, a collection of anything dork that I have found over the past 30 years of comics and toys, cards, etc. This is in Very Fine / Near Mint condition! The small, 1 ½ crease at the top of the cover is a production blemish. Here I have an outstanding copy of the. Wizard: "The Guide to Comics" Magazine #6-HULK Cover-2/1992-NM-/NM: Beautiful Cover FeaturesHULK! slight rip in the binding but still good. Soft Cover. Fine / Very Fine condition. Here I have a pretty nice copy of the. Contains lots of interviews, stories and information. It's a good resource for any superman fan. Learn all there is to know: how superman developed throughout the years, a list of Superman’s villains / supporting characters and more. This is in Very Fine Plus condition! This is in Fine plus condition! FOGEL'S Underground. FOGEL'S Underground (Comix). Signed by Author/Editor/Publisher DAN FOGEL! By Dan Fogel. Published in 2015 byHIPPY COMIX PRODUCTIONS. 9,644 entries of comics, magazines, and books in the 204 pages in theIdentification/Price Guide Section are filled with information on eachitem's title, issue number, printing-number, date, cover price, publisher, artists, and distinguishing aspects. Mike Mignola Cover. With promo cards (Spawn Foil Card / Bone Card 1 ). Wizard Comics #31. I am not a professional grader. Is purely my opinion. Buy More and Save. Magazine is sealed. Take a look at the photos and judge the condition for yourself, I can take more if needed. San Diego, Ca. This catalog has never been read but does have shelf wear. There is a small tear to the upper right hand corner on the front cover. PUBLISHED BY WIZARD PRESS IN 200 5. THIS MAGAZINE IS IN VERY FINE CONDITION. BATMAN MOVIE ISSUE / WONDER WOMAN. A NICE SHARP BOOK. Offered for bid is this NEW, The Official M.J. HUMMEL Price Guide, Paperback 2010, 2000 Full Color Photos Plus Figurines & Plates. Shipped with USPS Media Mail.